Back office and production planning? Get real time demand now! 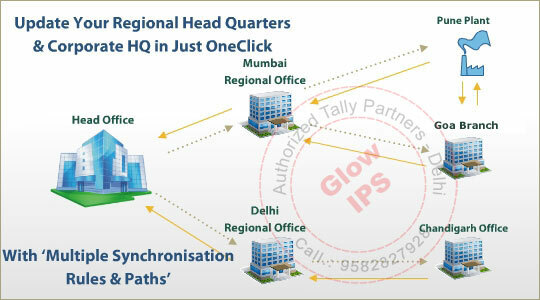 Multiple sync paths in Tally.ERP 9 enables business information flow between branches, regional head quarters and to Head Office in just one click. Bangalore. Now this is just a click away! Stores Manager at Pune plant. Again just a click away! By this set-up, business requests which can be addressed by a branch will be prioritised instead of sending the same request to Head Office for fulfilment. Lateral sync is also possible between branches in a region to optimize transactions and derive cost advantage. As stated in the example above, if Ahmedabad Branch has stock requirement which can be fulfilled by Pune plant that falls in the same region, then the request for material is fulfilled inside the RO purview instead of going to the Head Office. Apart from commercial businesses, this feature also helps Government bodies. Say for e.g., now a VAO (Village Administration Officer) can by a single click send the fund utilisation report to his District HQ and at the same time update the respective Ministries! Multiple sync can be set to function automatically without multiple clicks. Flexible mapping of Head Office and branch offices based on business need is a very effective solution for businesses. Multiple sync can be set to function automatically without any manual intervention. This facility will ensure any alterations done at any level (say a Branch office or Production facility); will be updated back to the originator of the transaction. Say for example, your Delhi Branch has booked a Sales Order with a term of delivery of 10 days. This information has moved to the HO located at Bangalore and then moved to Pune plant location. The factory is changing the order terms to 20 days delivery and wanted this information to go back to Branch that has booked this order. Now Tally.ERP 9 will remember this synch route of 'Delhi Branch > Bangalore HO > Pune plant' - due to this intelligent feature, so that the information will reach the originator i.e., the Delhi Branch.